Nusentia Enzyme Miracle provides digestive enzymes for dogs and cats to aid with vitamin absorption and support for the digestive process. 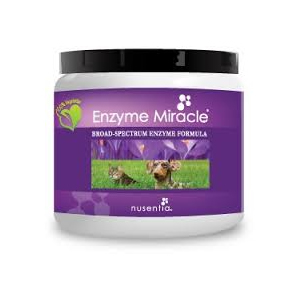 Enzyme Miracle provides complete support against digestive stress, yeast, allergies and pancreatic issues. With regular use, expect improved nutrient absorption, reduced toxin build-up and reduced inflammation. Digestive problems including leaky gut syndrome and gas. 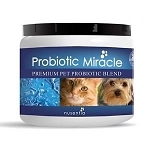 Nusentia Enzyme Miracle supplies enzymes that are missing from most commercial pet foods and for older pets with diminished enzyme production. Enzymes are necessary to break down foods and for improved vitamin absorption. Tiger is a rescue dog and was very thin when I got him and he remained thin even though I fed him my own recipe for my dogs. He has some kind of digestion problem and I don't know what it is but giving him Enzyme Miracle for dogs seems to be helping him a great deal. The most important enzymes in your pet’s digestion for catalyzing the digestion of meat and proteins and their reduction into usable amino acids. Processed and cooked proteins in pet's food are difficult to digest and create an immune reaction when the necessary enzymes are not present at digestion. With vegetarian (plant-based) protease 3.0, 6.0, and 4.5 added to the meal, they break down intact proteins completely, allowing their vital amino acids to be available to your pet. Breaks down carbohydrates into sugars for energy and other body systems. (Related to Amylase) This key enzyme breaks down carbohydrates and starches to maltose, providing available energy from your pet's meal. Metabolizes fats (lipids), and triglycerides for improved cardiovascular and neural health. Breaks down fiber, which is a difficult process for pets naturally. Without cellulase present in the diet, your pet relies mostly on fermentation to break down cellulose fiber which limits his ability to use its energy and eliminate toxins. Has both systemic and digestive enzyme properties. Bromelain is a protein digesting enzyme which is also has anti-inflammatory properties. Excellent for aging or arthritic dogs. A systemic and digestive enzyme breaks down fiber, fungi, yeast, and bacteria. 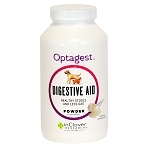 Incredibly helpful for dogs suffering from yeast, candida, and gas associated with poor digestion. A sub-call of proteolytic metabolizing enzymes, catalyzes peptides to amino acids, giving protein digestion a boost. A sub-class of cellulase which breaks down the cell walls of plants. Plant fibers can be a challenge for dogs, hemicellulase remove the internal fermentation process many dogs use to break down the modern diet. Feeding Directions: Do not refrigerate. Measure 1 scoop (appr. 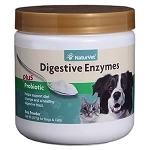 1/2 teaspoon) of digestive enzyme powder for every cup of food you feed your dog or cat. For best results, allow 5-6 weeks of consistent use to establish lasting improvement. In some cases, usually with pets that have serious digestive issues or toxin build up, pets experience a detoxification period and may display symptoms of sensitivity, such as, nausea, vomiting, or diarrhea. These symptoms may occur while your pet purges toxins, and for some, this happens too quickly. In cases like this, it is recommended that you introduce the enzymes slowly so as to ease this adjustment period, starting with a 1/4 serving and gradually work up to a full serving by 6 weeks.